Our Online Databases A to Z page has a new look! Search for databases by subject. Now you can select your major or area of study from the drop-down menu for a list of recommended resources in your subject area. In addition to subscription databases, the list also includes relevant research guides and contact information for the librarian who specializes in that field. Search for databases by content type. Are you looking for ebooks? Open-access resources? Use the drop-down menu to find the resources that best fit your needs. Search for databases by vendor. You may know our resources by names like Ovid and EBSCO. Those are actually vendors who provide databases such as PsycINFO and Business Source Complete. Now you can sort the A to Z list by vendor to see which company provides which databases. Find out about free trials. The Library regularly offers free trial access to resources outside of our collection. Trial databases can now be accessed on our A to Z page. Right now we have trial access to Civil War Primary Sources, HeinOnline Government, Politics, and Law, Latin American News Digest, Sage Research Methods Videos, and SciFinder. We’re evaluating all of these for possible future subscriptions, so if you like them, let us know! Find out about new resources. Access arXiv, which provides open access to e-prints in physics, math, computer science, quantitative biology, quantitative finance, and statistics, from the A to Z page. 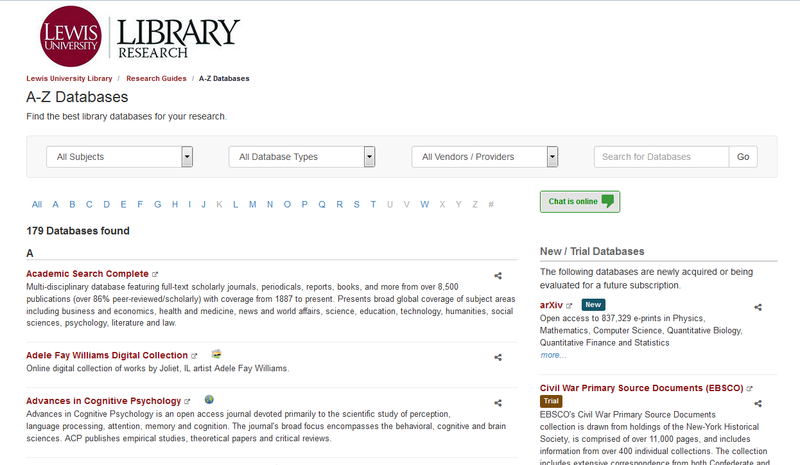 If you have questions about the new A to Z Databases page or any of the resources on it, let us know! You can contact a librarian by phone, email, text message, or online chat–and of course, you can always stop by for a demo.